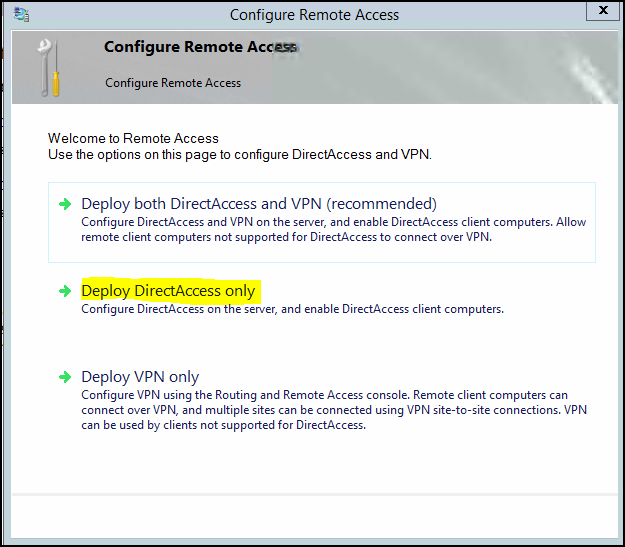 I found it quit difficult to configure DirectAccess on the Citrix NetScaler combined with Windows 10 machines. 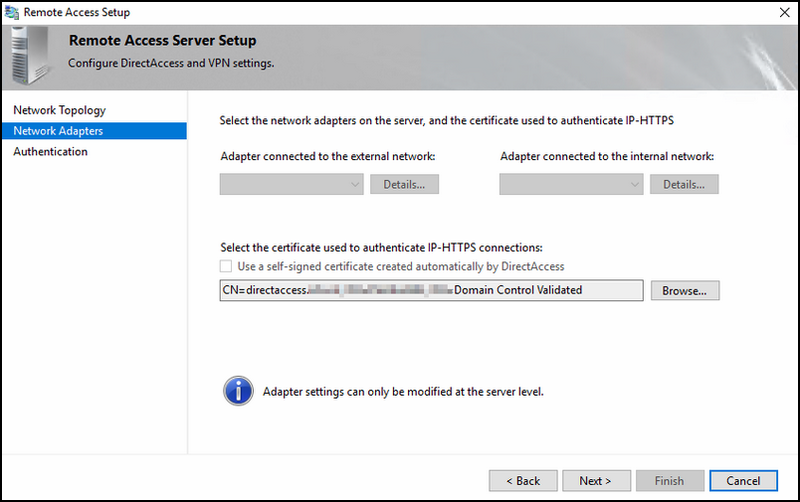 This because Windows 8 and 10 machines connect differently to DirectAccess than previous versions when using a IP-HTTPS connection. 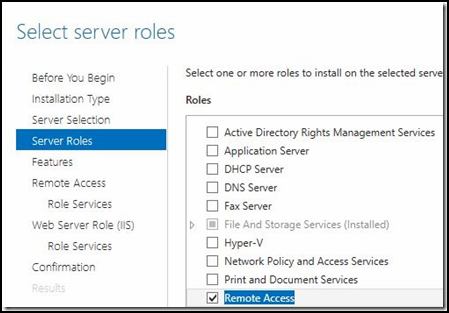 Yet again, I struggled with this setup after watching again a real good Webinar by Citrix about using advanced ADC configuration for Microsoft DirectAccess to improve data center security in which Richard Hicks took a big part in. In that webinar he showed what to watch out for when configuring a VIP for DirectAccess; the only thing is; when you pause the video at 43m 17s, and look closely to the SSL configuration… you'll notice it wouldn't work; encryptions protocols like TLS 1.0, 1.1, 1.2 and SSLv3 are disabled; if you would copy that literary to your NetScaler; it won't work. So the part of the used Cipher suites is true, but don't pay close attention to the rest of the screen. But still; this Citrix video is great to watch and Richard explains a lot; what is good thing of course. That speeds up a lot and enhances performance and scalability (less servers needed because less processing power is needed for the same amount of users). I can hear you thinking; what about security. Well the good thing is, if the briefcase was intercepted by some entity; they only find a real safe in the briefcase. But wait a minute; SSLv3 ?! That is vulnerable for POODLE attacks! Yes that is true, and I can't 'put a needle in between of that' (literary Dutch translation :) ). Yes, SSLv3 is vulnerable for POODLE and I'm fully 100% agreeing with you that it shouldn't be utilized. Think back to my Safe comparison; the interesting payload is encrypted via IPv6 using its Extension Headers; so no matter what the safe is transported in; hence if it was a wicker basket (extreme comparison), the interesting data is still protected. What will I have after reading this blog post ? Well, if you ask me :) you will have a highly scalable and performing DirectAccess environment that is both safe and very fast. 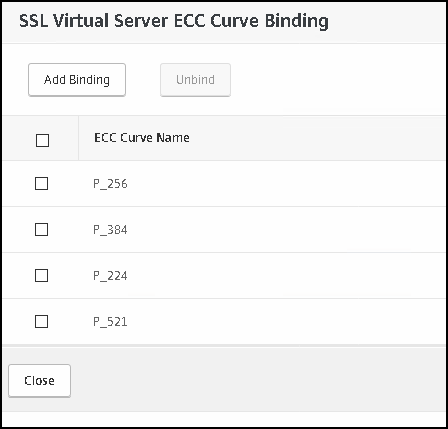 This because we are using the HTTPS with the SSLv3 protocol, a NULL cipher and protecting the VIP with the 'request client certificate' that is mandatory for successfully setting up a DA connection by the client. 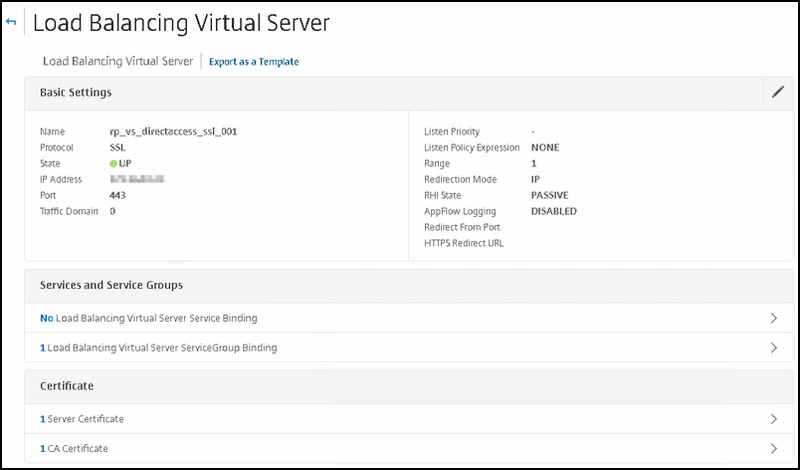 Citrix NetScaler 11.1; one armed configuration with 2 subnets. Windows 10 Clients are receiving Computer Certificates. 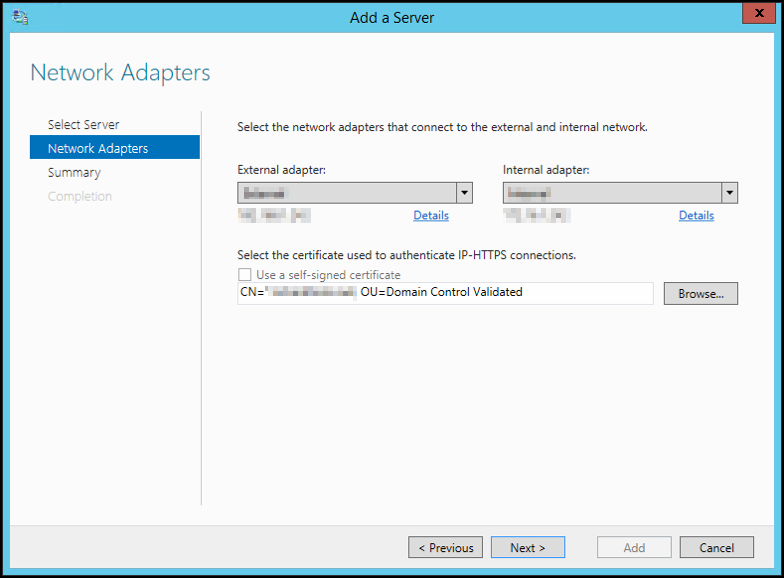 The PKI CA certificate is installed on your NetScaler. 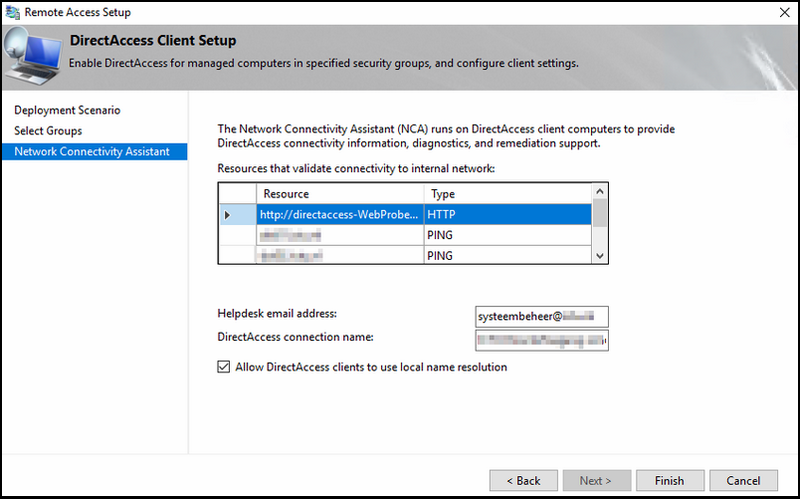 This blog post is about preparing DirectAccess on Windows 2012 R2 for Windows 10 clients and is based on the following prerequisites. Here you can see a technical design (figure 1) how it will look like when were are done. 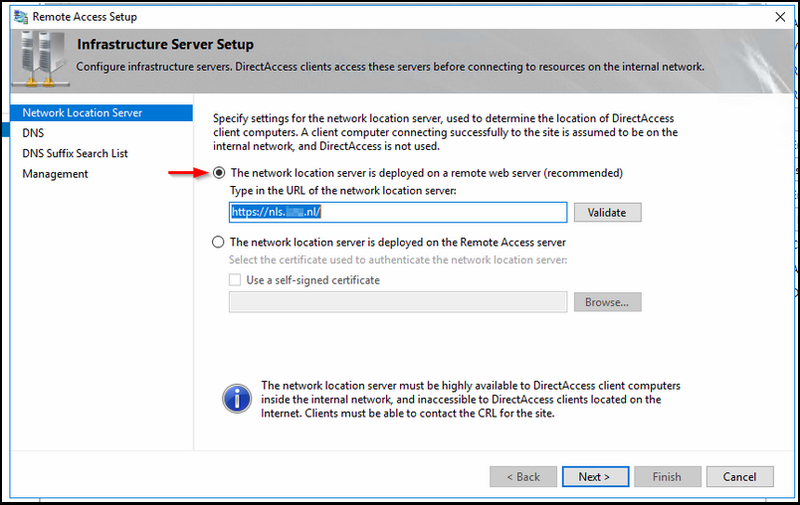 DirectAccess depends on Network Location services to check if the computer is on-premise or not, so the NLS service is a critical part of your DirectAccess Setup. 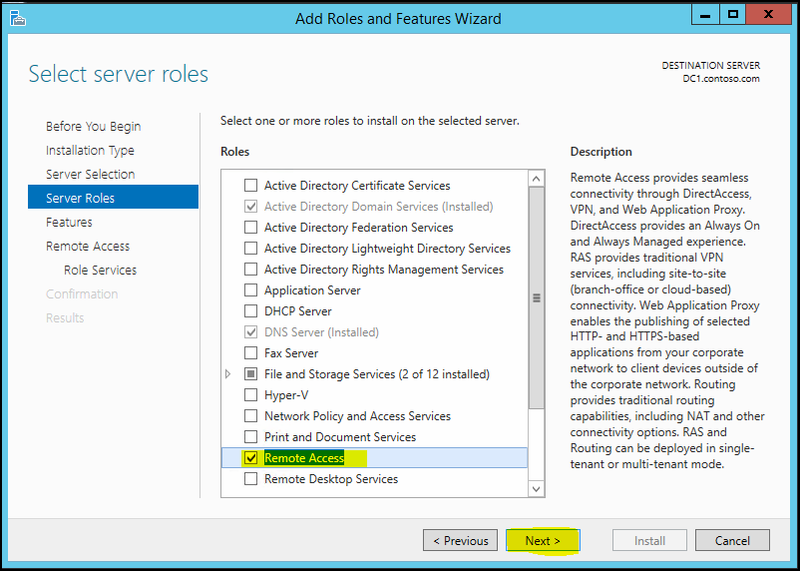 Microsoft discourages to install this role on the same server as DA itself. 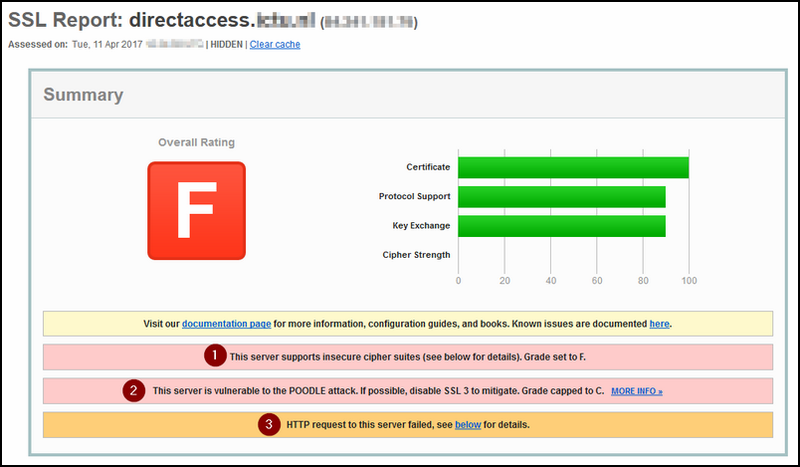 Also don't install this NLS role on an intranet web server, but use a dedicated server for this. 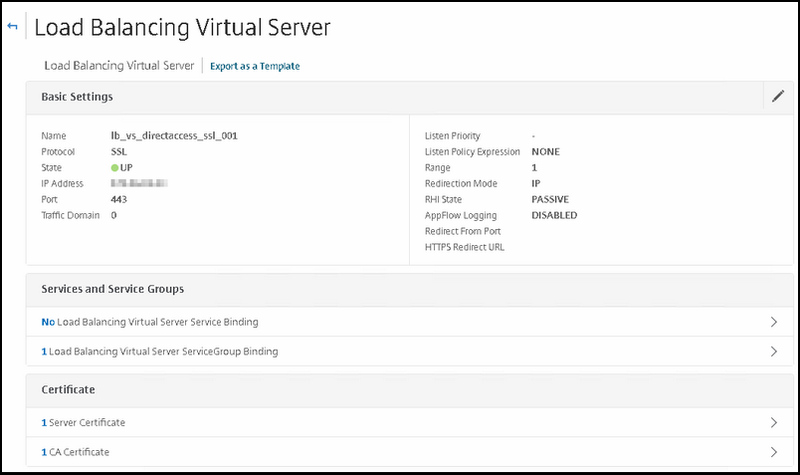 The Citrix NetScaler can do this for you; just go to this website. Richard Hicks explained it very well how to do this, so I won't type it for you. I borrowed this part from another site for your convience. First import the certificate on the first DA server; make sure that it is place in the Personal store of the Computer. 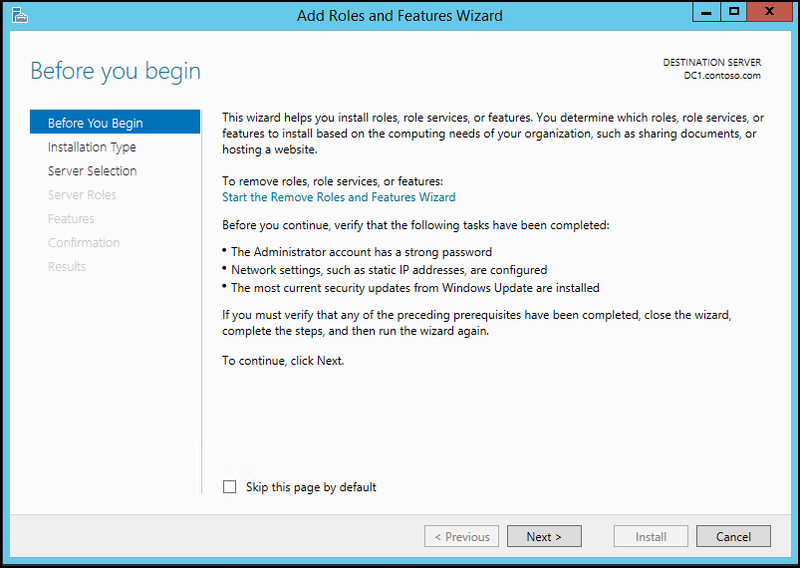 Incase that you don't know how; follow this article on TechNet. 5. Then in next window (figure 16) it shows 4 main steps to complete the configuration. Select the first option; that is what you want. 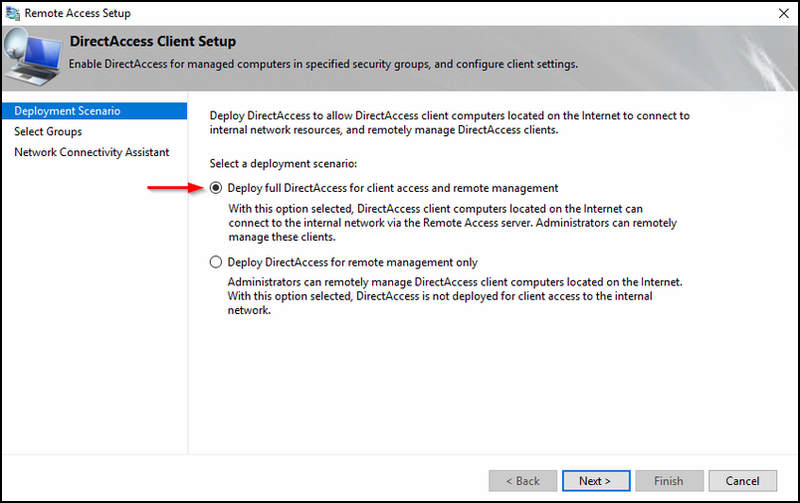 Select a security group by clicking Add; I would suggest that you first select a specific group for testing purposes that only have DirectAccess test workstations. You can always change afterwards it to something else; like for example Domain Computers; but keep in mind that you always must use the wizard like the one below (figure 18). Altering the GPO directly will have negative effects. Also make sure that both check boxes are NOT selected. 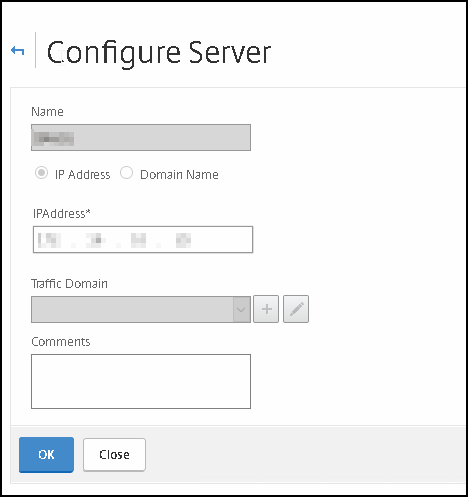 Pinging to servers; for example two domain controllers. 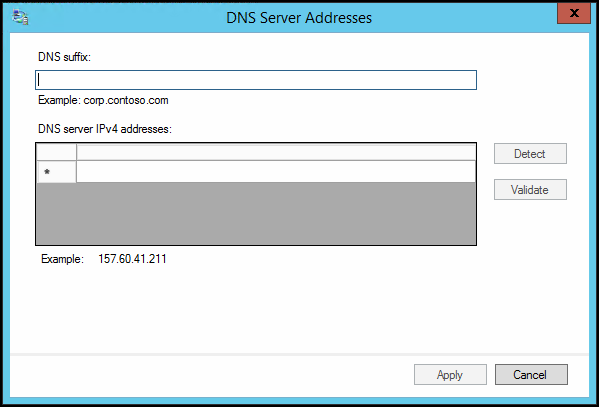 Also fill in the helpdesk email address and the DA connection name; that name will be visible in the Network & Sharing Centre and make sure that the local name resolution is checked. 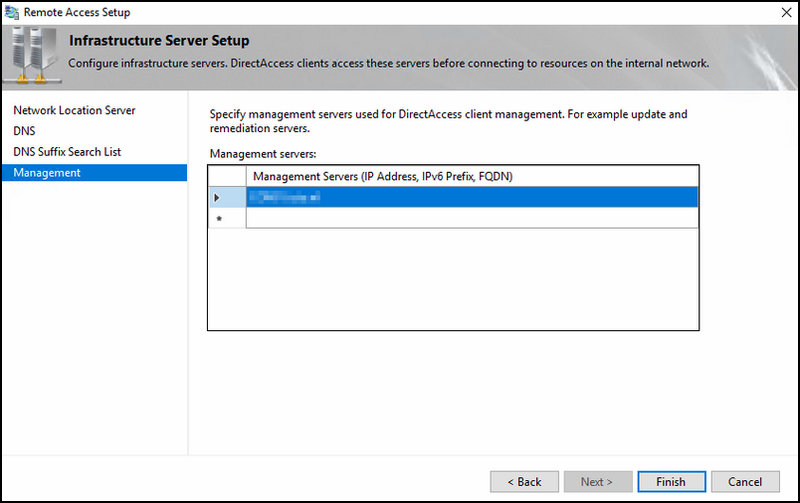 Fill in the name for your DirectAccess service; this URL will be used for the DA clients to connect to. 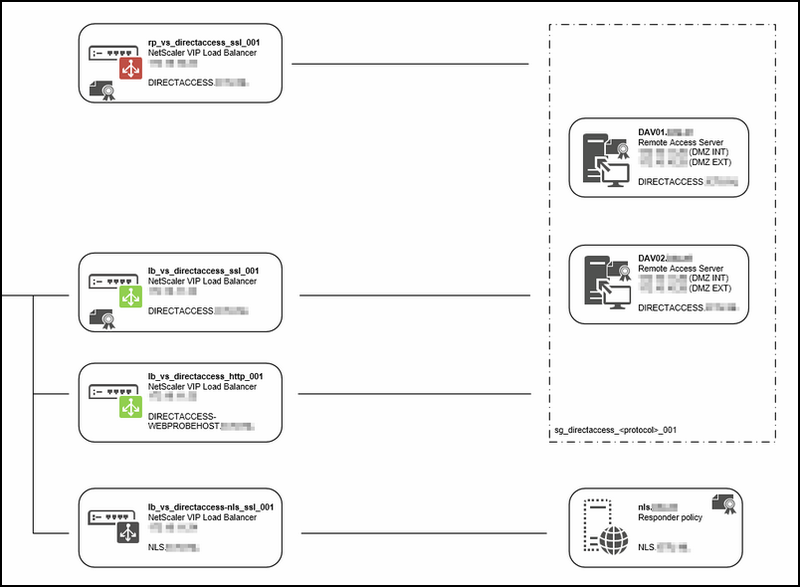 Once you have imported the SSL certificate for DirectAccess to use, choose the correct adapters for internal and external connections. 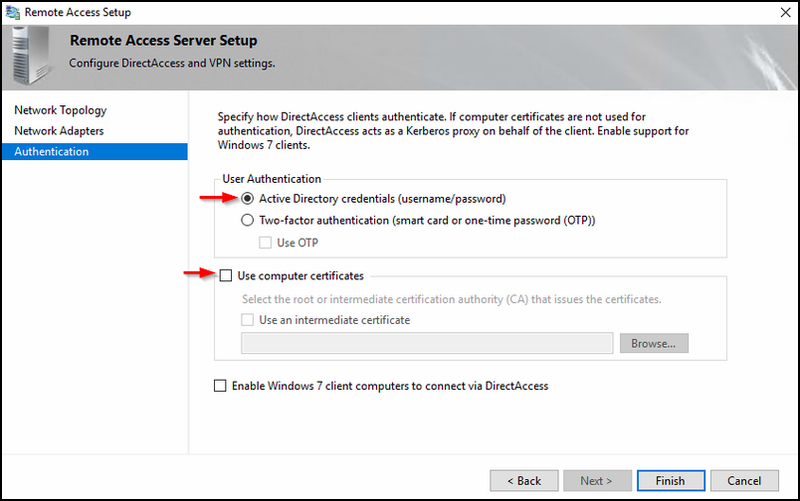 Select the option 'Active Directory Credentials (username/password) and make sure the "use computer certitifcates'' is unchecked. The last one can be enabled if you use windows 7 clients; this has to do with the WMI filter that would be enabled on your DA policy. Fill in the NLS URL and validate it. this URL will be installed on the NetScaler. Here you must select the interesting traffic for to be put in the DA tunnel and what specifically not. Before adding name suffixes; choose the 2nd of local name resolution options. 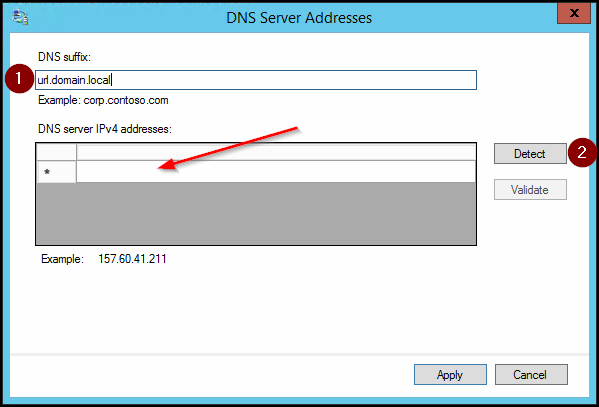 Click on Detect; you'll notice under the RED ARROW that the DNS64 address will be filled in with a IPv6 address (to be specific the DNS64 address of DA. 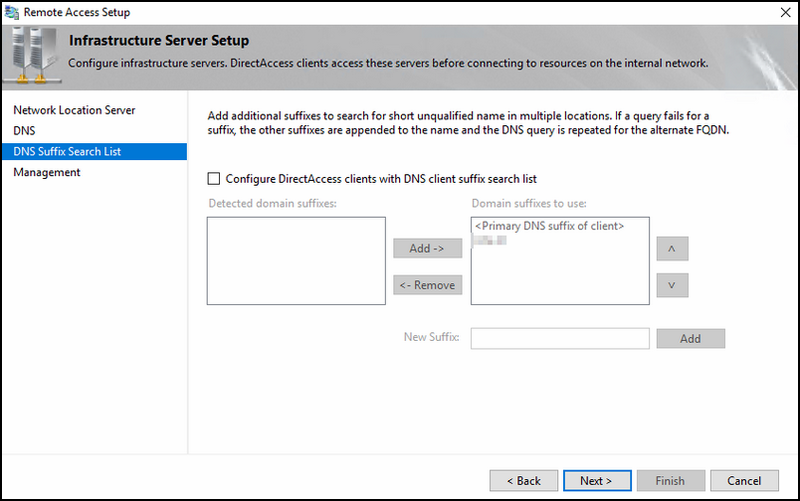 NOTE: If you add a line without a DNS server, thus filling in the URL and click directly on Apply; the DirectAccess tunnel will not be used for that URL and local name resolution will be applied. Traffic will not traverse the DA tunnel. 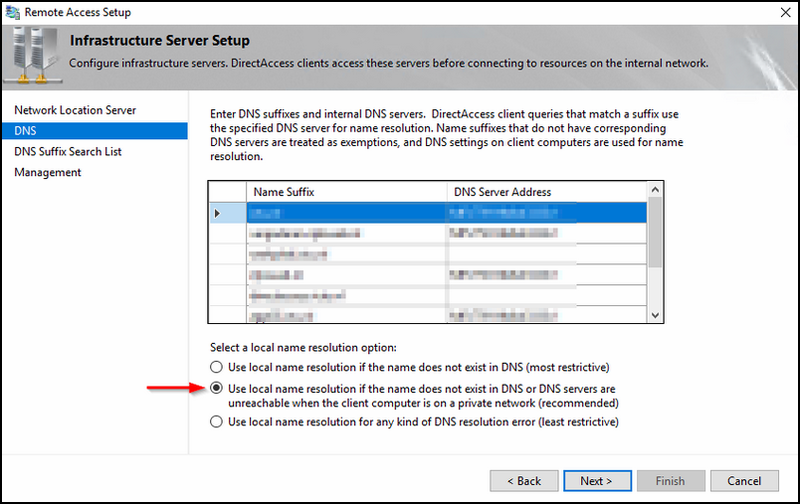 Leave this default; don't change anything, unless you have more DNS suffixes that you use within your organization. 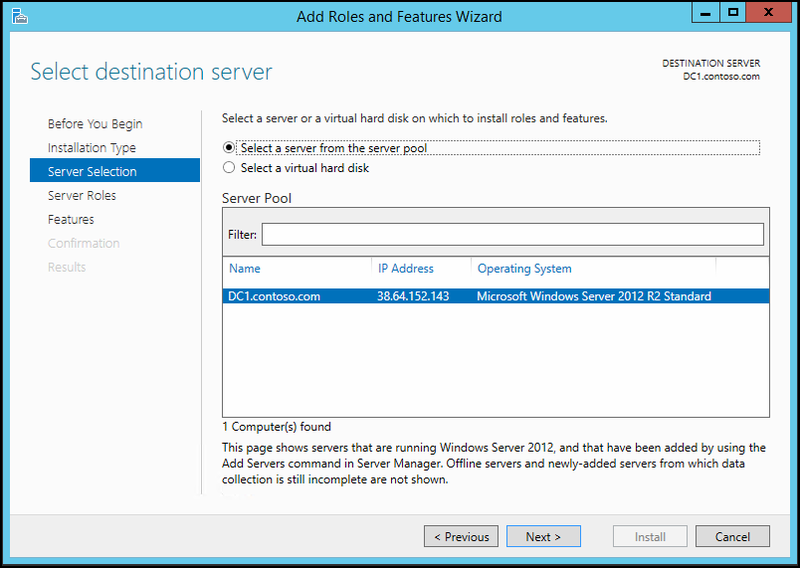 The management section; you can fill in a SCCM server for example for remediation. 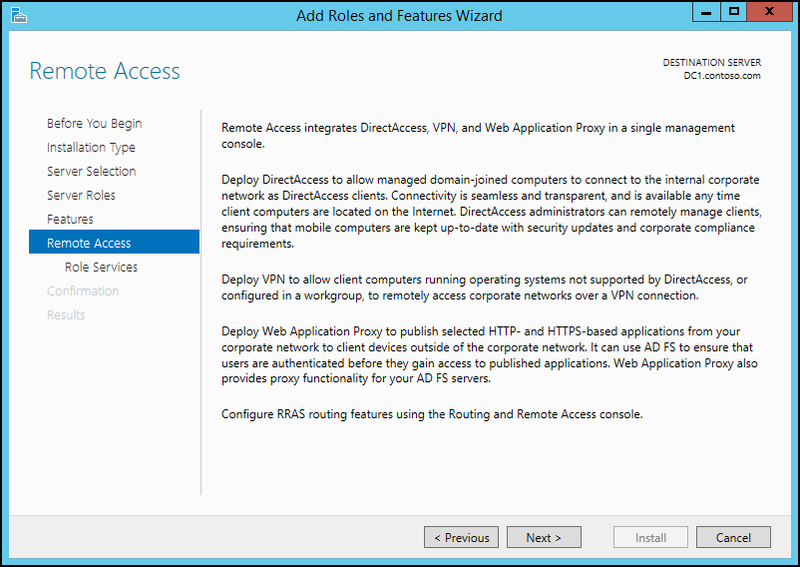 So that's it for the DirectAccess setup (woohoo!) 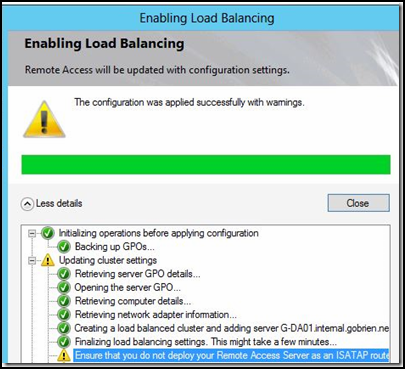 now lets continue by enabling External Loadbalancing. After this; enable the load balance feature. 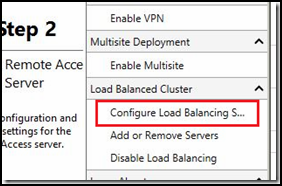 For enabling external loadbalancing I followed the article How to Configure DirectAccess in Windows Server 2012 to Work with an External Hardware Load Balancer. I grabbed 90% from the above link, but in the last 10% I adjusted slightly to make it fit for your DirectAccess Setup. 1. 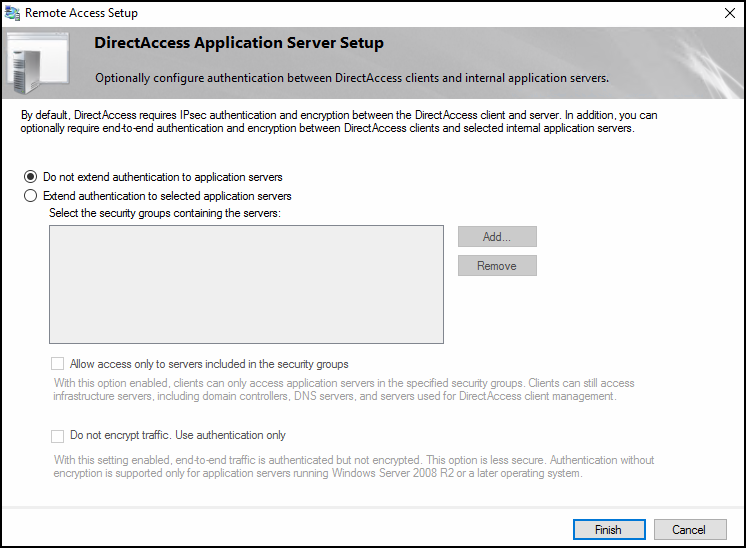 Logon to the DirectAccess server that is currently in operation. This will be Node1. 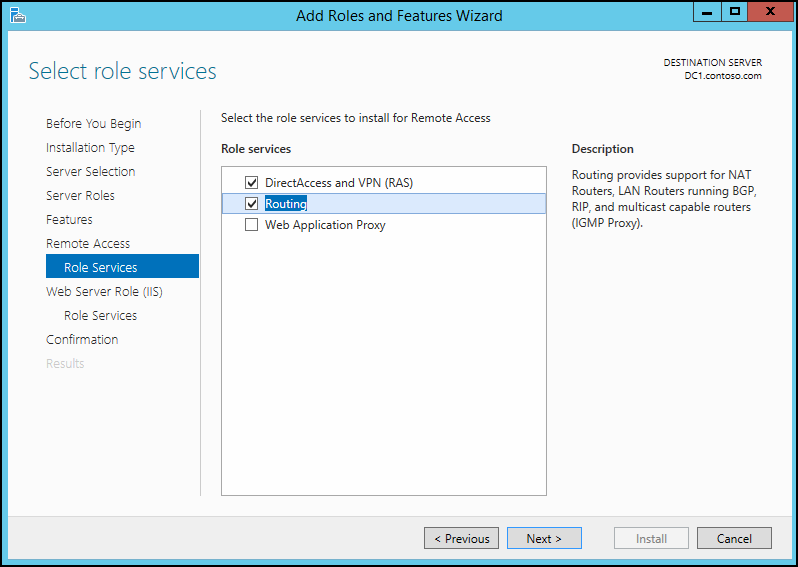 Launch the Remote Access console to begin the DirectAccess configuration. 4. The wizard will ask for a new dedicated IP address for Node 1. 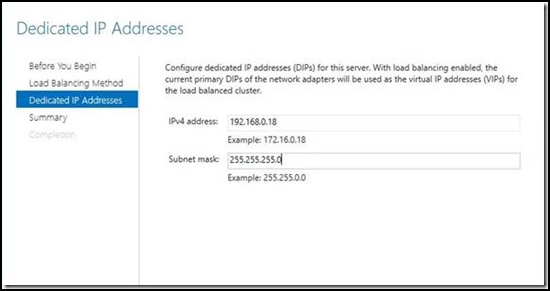 The existing dedicated IP address will be used as the virtual IP address of the load balancer to avoid requiring any DNS changes as a result of this process. 5. Click “Next” to proceed to the Summary page and then click “Commit” to apply the changes. 7. 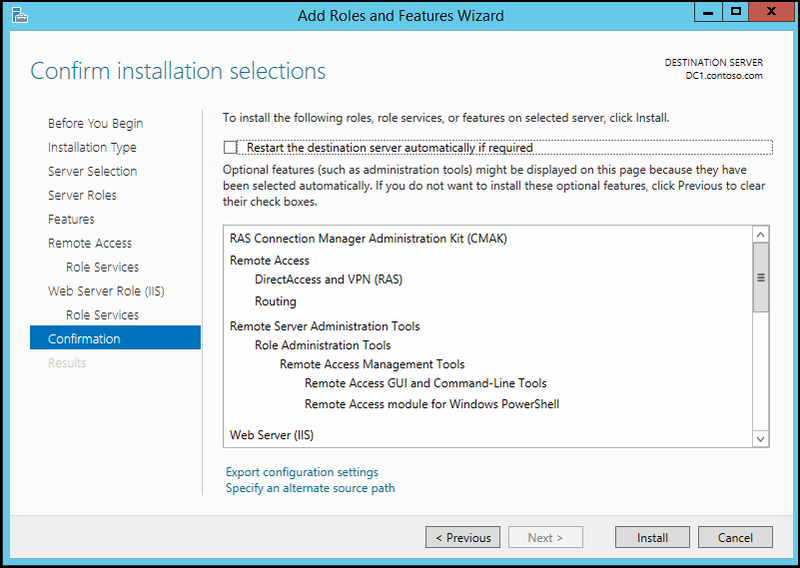 Now head over to your second DirectAccess server and configure the Roles and Features to add the Remote Access components. 9. 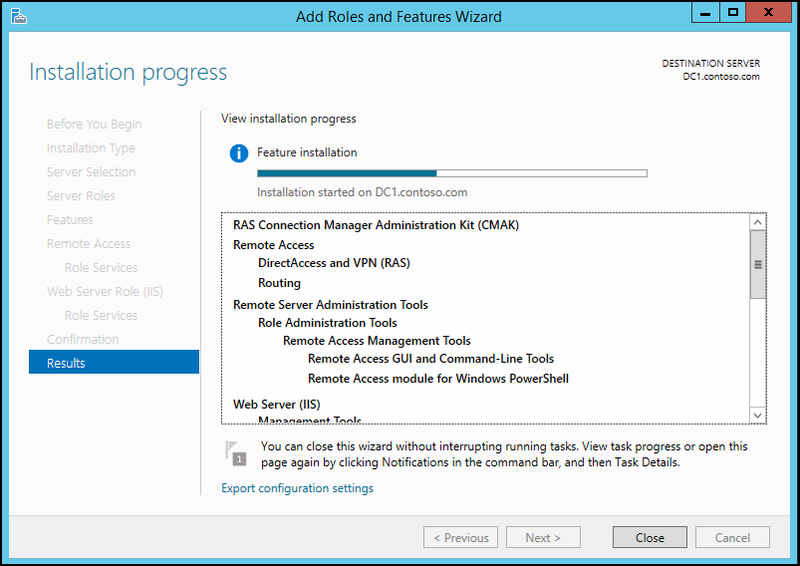 Now head back to first DirectAccess server and open the Remote Access console. 13. Click “Commit” and then close to apply the configuration. 14. 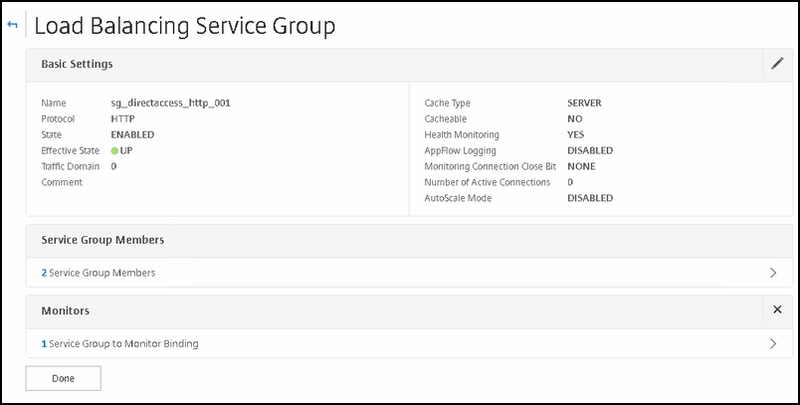 Once the configuration is complete, you can click on the “Operations Status” link in the console to check the status of the array. 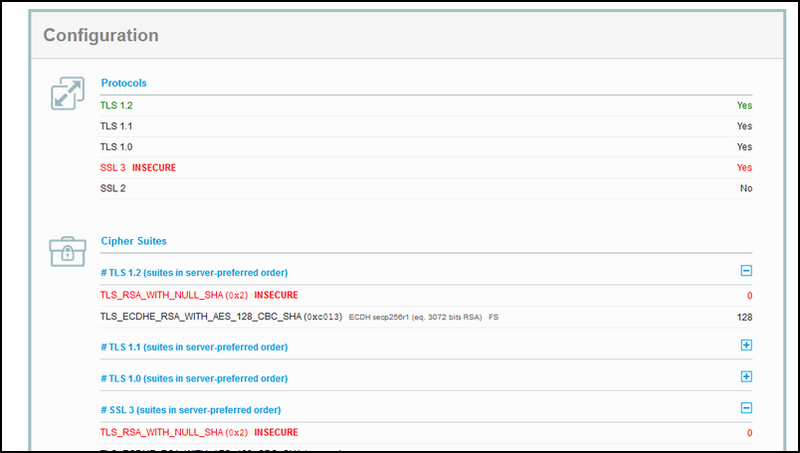 And with that all completed, we have a Dual-NIC DirectAccess 2012 deployment with external load balancing! 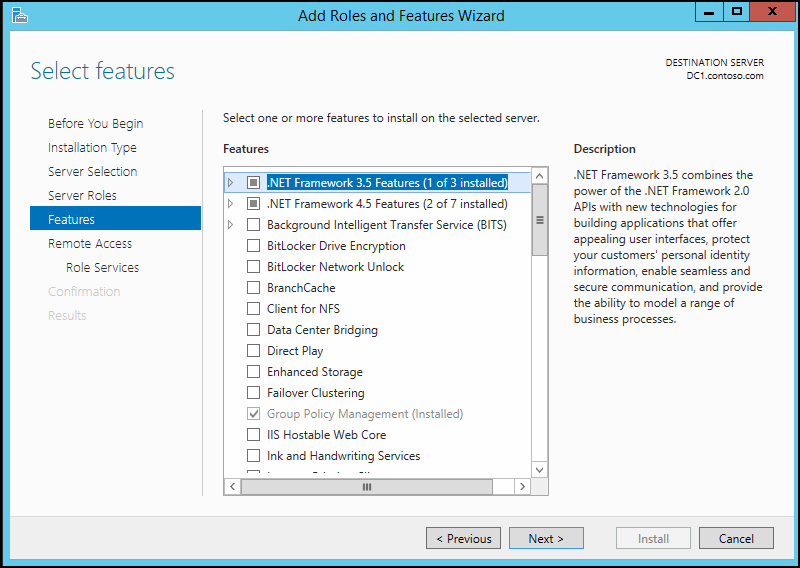 From here I will show how to configure the DirectAccess infrastructure in to your Citrix NetScaler. 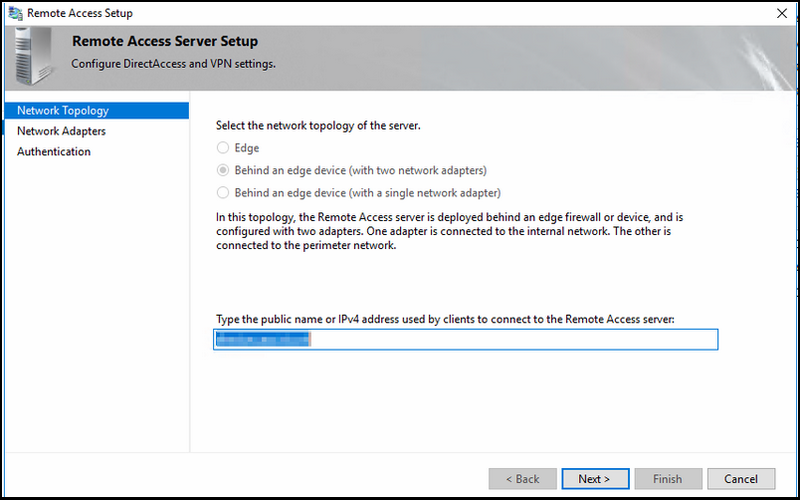 Fill in the FQDN name so that you can recognize it easily and its IP address to where the NetScaler will connect to; in our case, this must be the External IP of the DirectAccess server. After that, click OK and repeat the steps for the seconde Node. Before we create the service groups; me must make sure that we have created the SSL profiles. Go to System -> Profiles -> SSL Profile and click on the SSL Profile Tab. one for the back-end connections towards the real servers. That way we can easily change an SSL profile that is configured for multiple VIPS, if for example a cipher suite gets depreciated in the future for some reason. The first profile that we will create is used for Front end facing connections. Next we will create the SSL profile that will be used as the back end facing one; lets create it. 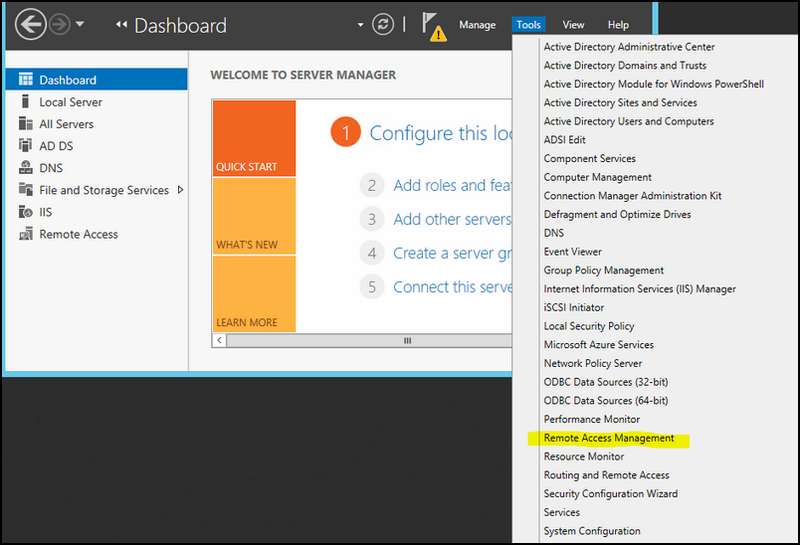 Now let's create a monitor for the NetScaler so that it can perform health checks of each DirectAccess server. One for HTTP connections (like the webprobe). 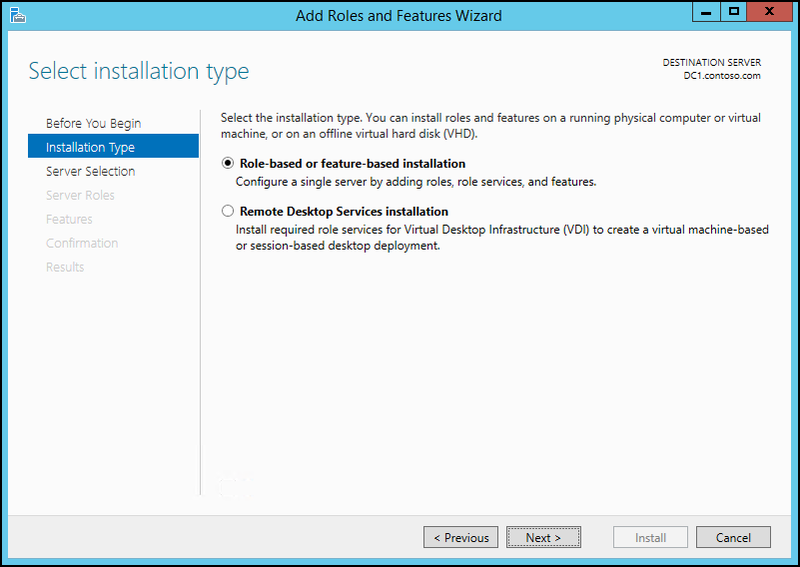 No we can create the VIP's and configure them appropriately. NOTE: The VIP with NLS in its name is the one I created by following Richard Hicks thread on his Blog, you can follow the article that Richard Hicks posted; I won't elaborate on that one. As you maybe can remember, i have created four VIPS. 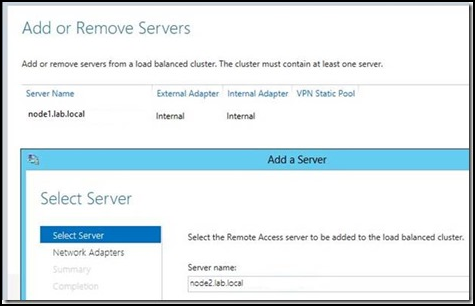 Create the first VIP for internal load balancing DirectAccess client connections. 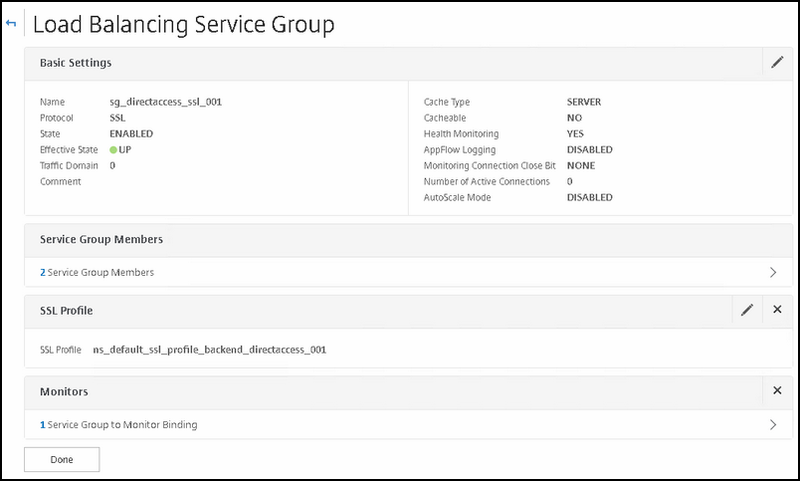 Select the service group that you created earlier. 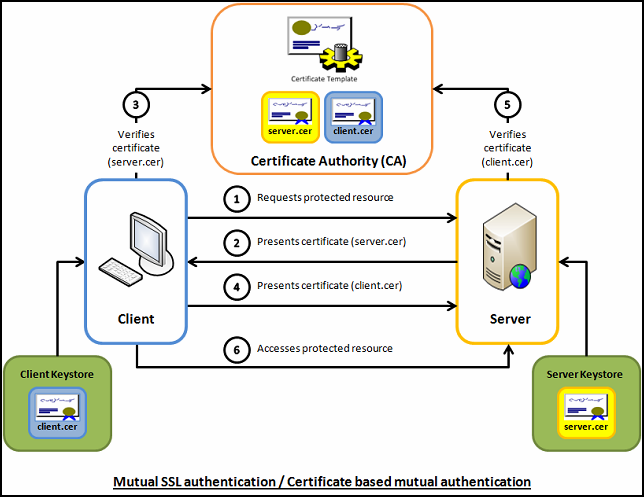 Here you can see a brief explaination how client certificate verfication works. 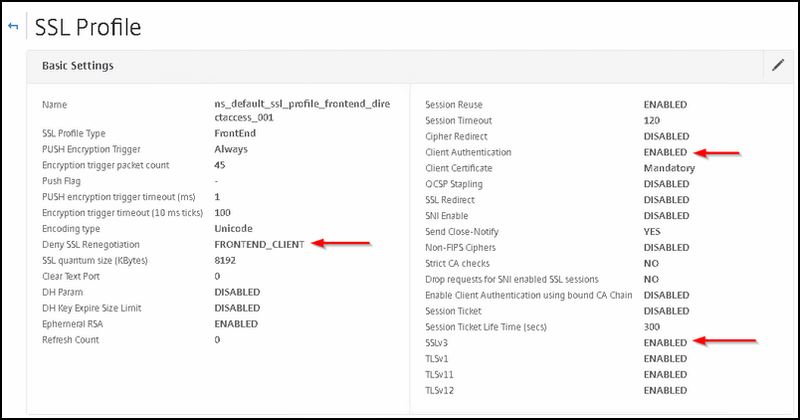 In SSL profile for front-end clients we enabled the Client Authentication. 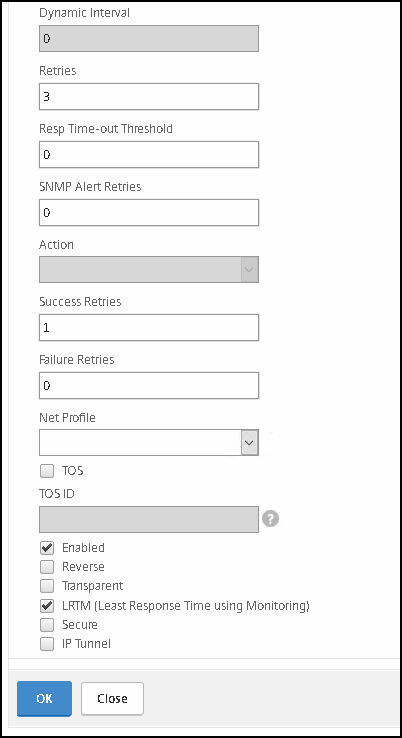 Settings for the SSL profile settings. NOTE: Persistence is important, otherwise you will sometimes see the same user with connection to both DA servers, thus making manage-out very difficult if not impossible. By using persistency, you can resolve this. 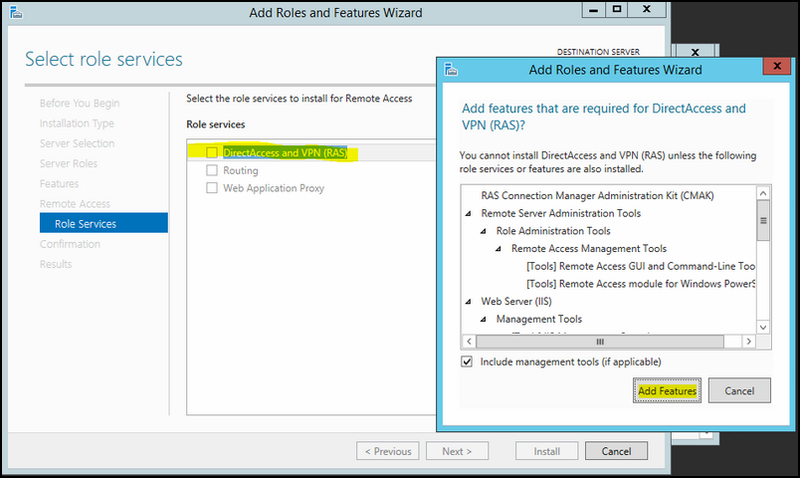 Now create the VIP or the DirectAccess client connections when they are not on premise and it looks the same as the inside VIP. That's it; where done here. 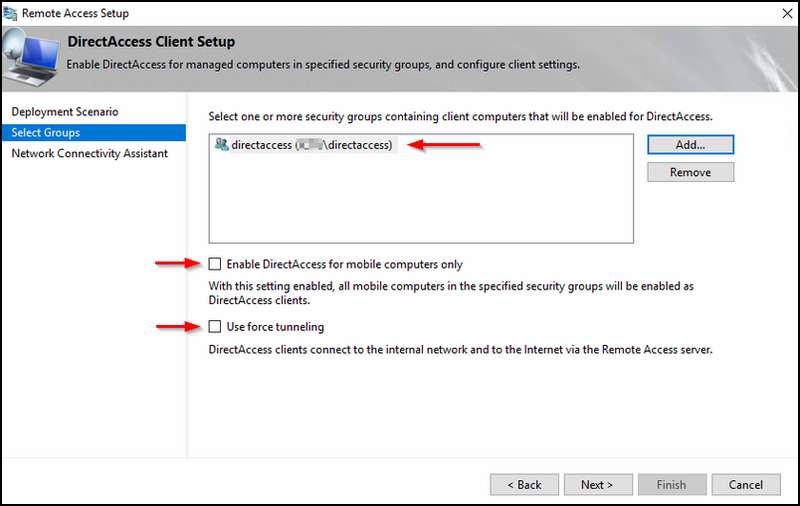 Now you can test DirectAccess by first deploying the policy that DirectAccess created automaticly during installation to your mobile workstations (make sure that they are member of the security group you choose earlier) and that the GPO is loaded on the workstation. But wait a minute, what about the RED F on SSLLabs.com ? Yes, that is true, I said earlier that it would come back on that one. 1. The insecure NULL cipher suite that is available for use, though we need it for Windows 10 clients. 2. By using SSLv3, the server is vulrneralbe for POODLE attack, but again, we need this protocol for the Windows 10 clients. 2. Exporting them is prohibited. More about F rating on Richard's blog here. And what about the SSL for internal purposes? 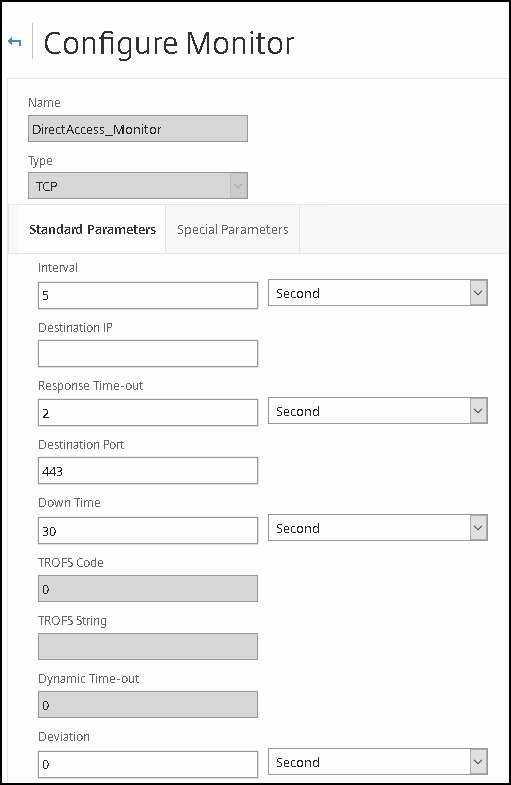 Oh before I forget to mention, look at my other post regarding ISATAP and the things that you should not do on your DirectAccess environment.